CAMARILLO, Calif., Mar. 29, 2018 – Semtech Corporation (Nasdaq: SMTC), a leading supplier of high performance analog and mixed-signal semiconductors and advanced algorithms, announced that KernelSphere Technologies, an India-based IT manufacturer and services company, has integrated Semtech’s LoRa® devices and wireless radio frequency technology (LoRa Technology) in KemelSphere’s smart grid transformer monitoring solution. 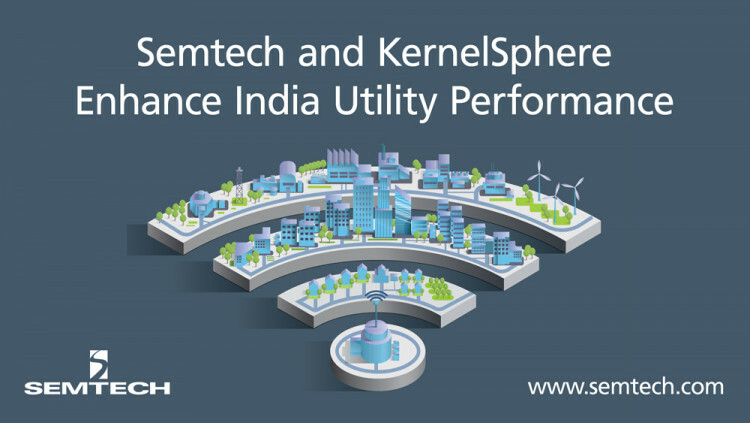 KernelSphere Technologies entered a joint venture with Jamshedpur Utility Services Company (JUSCO) to establish one of India’s first fully smart city. JUSCO is currently using more than 100,000 LoRa-based sensors and gateways connected to a LoRaWAN™ network to digitize its infrastructure solutions including street light, parking, electricity meters, water meters, and waste bin management. JUSCO is India's only comprehensive urban infrastructure service provider. Created from Tata Steel, specifically from its Town Services Division in 2004, JUSCO’s mandate is to convert an obligatory service into a customer-focused sustainable corporate entity. “It is indeed a proud moment for JUSCO to become the first utility company in the world to install LoRaWAN compatible transformer monitoring devices. I believe this is a step ahead of the transformational phase for city management in India, paving the way towards operational efficiency and data analytics for smart decision making,” said Ashish Mathur, Managing Director at JUSCO. KernelSphere’s Transformer Monitoring System communicates smart grid operational data such as power, current, voltage, load balance, oil level, and temperature of transformer mechanisms. The solution also provides preventative maintenance capabilities and actionable analytics for remedial actions. For instance, SMS alerts are sent, and fans are turned on automatically when equipment temperatures exceed preset limits. Comprehensive historical reports provide trend data to facilitate decisions about network planning to address critical points that need to be extended or upgraded. KernelSphere Technology offers innovative IT solutions and services with a focus on exceptional customer service and training. The company is an end-to-end systems integrator providing the most advanced software, hardware and connectivity solutions. Professional consultants and engineers design customized IT solutions to meet project requirements. KernelSphere is located in India and runs IoT Labs at various universities in the country. For more information, visit www.kernelsphere.com. In a first of a kind initiative in India, the Jamshedpur Utilities and Services Company Limited (JUSCO) was carved out of Tata Steel from its Town Services Division in 2004. In JUSCO, the steel major reposed ten decades of experience and expertise. The mandate for JUSCO was to convert an obligatory service into a customer focused sustainable corporate entity. JUSCO is today India's only comprehensive urban infrastructure service provider. For more information, visit http://www.juscoltd.com/. All statements contained herein that are not statements of historical fact, including statements that use the words “to establish,” “to digitize,” “to convert,” “towards,” “to solve,” “designed to,” or other similar words or expressions, that describe Semtech Corporation’s or its management’s future plans, objectives or goals are “forward-looking statements” and are made pursuant to the Safe-Harbor provisions of the Private Securities Litigation Reform Act of 1995, as amended. Such forward-looking statements involve known and unknown risks, uncertainties and other factors that could cause the actual results of Semtech Corporation to be materially different from the historical results and/or from any future results or outcomes expressed or implied by such forward-looking statements. Such factors are further addressed in Semtech Corporation’s annual and quarterly reports, and in other documents or reports, filed with the Securities and Exchange Commission (www.sec.gov) including, without limitation, information under the captions “Management’s Discussion and Analysis of Financial Condition and Results of Operations” and “Risk Factors.” Semtech Corporation assumes no obligation to update any forward-looking statements in order to reflect events or circumstances that may arise after the date of this release, except as required by law. Semtech, the Semtech logo and LoRa are registered trademarks or service marks, and LoRaWAN is a trademark or service mark, of Semtech Corporation or its affiliates. Third-party trademarks or service marks mentioned herein are the property of their respective owners.